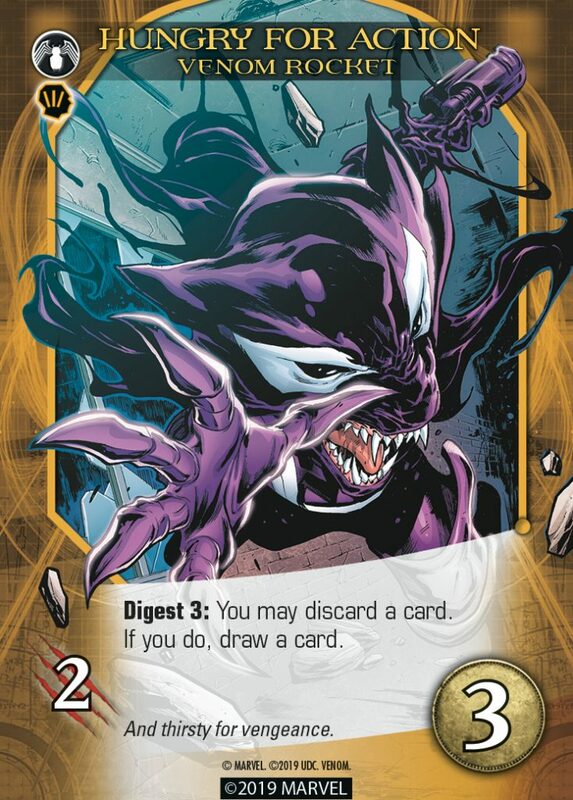 Hello and welcome to the first preview for the new Legendary® Venom expansion. Get ready to suit up and enter the Venomverse with the Legendary Venom small box expansion. 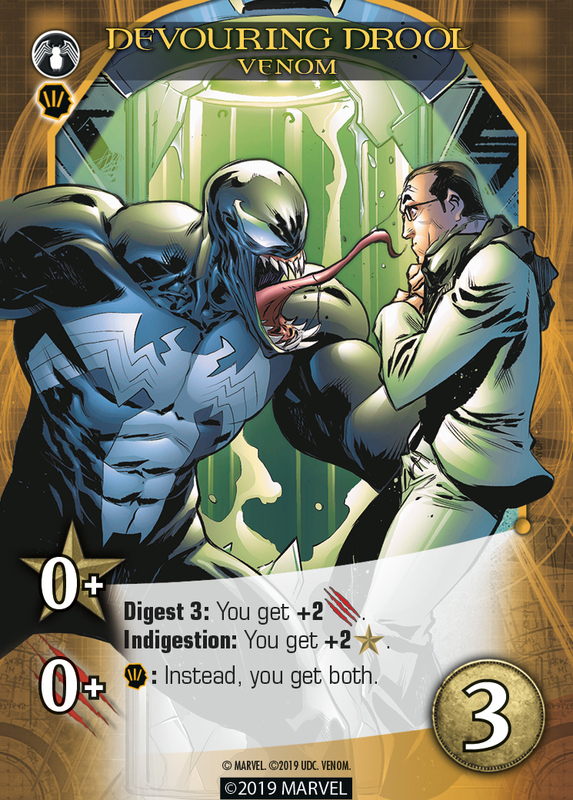 In this expansion, poisons have taken over and some of your favorite characters have bonded with the symbiotes in a last attempt to save the world. Featuring artwork from Venomverse artists Iban Coello and Matt Yackey, it’s time to dive into the dark side of the multiverse’s greatest heroes in this all new addition to the acclaimed Legendary series. Let’s sink our teeth into some of the new key words. 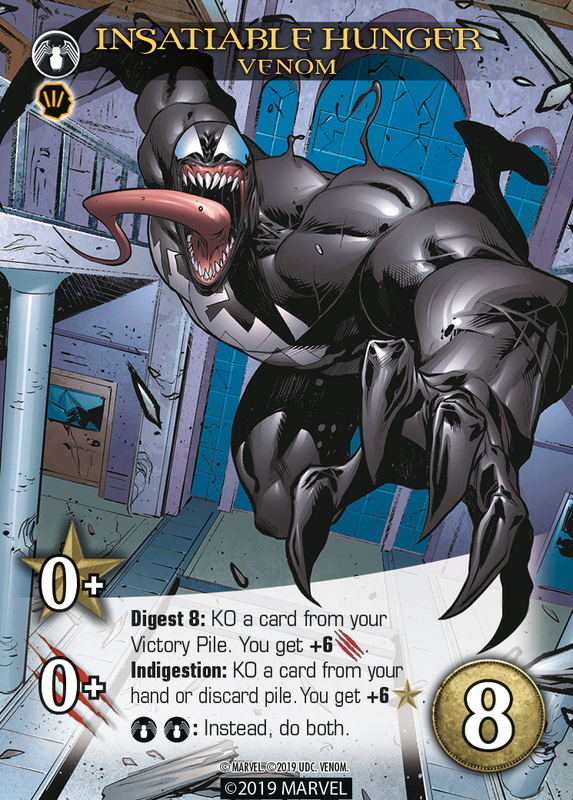 The keyword Digest represents how symbiotes increase their power by devouring people and absorbing their energy. When you see the Digest keyword you can only use that ability if you have at least that many cards in your victory pile. 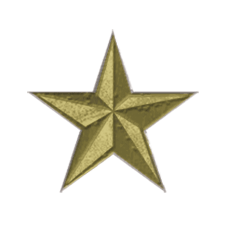 As an example with “Digest 2: Draw a card:” if you have 2 cards in your victory pile you will get to draw a card. The symbiotes have a veritable buffet of dining options with Henchman Villains, regular Villains, Bystanders, Mastermind Tactics, and Traps from all of the available Legendary sets. You don’t have to remove any cards from your victory pile when using the digest keyword. No matter how many cards you have in the victory pile, you can only use this ability for each card once per a turn. Hungry for power, the symbiotes are always looking to gorge themselves to the fullest. However, with the Venomverse overtaken by Poisons, the dining options are slim picking for your team and could lead to some upset stomachs. Not known for restraint, things become a bit messy when symbiotes aren’t kept in check. For those who enjoy pushing the limits of moral conduct the keyword Excessive Violence is used. 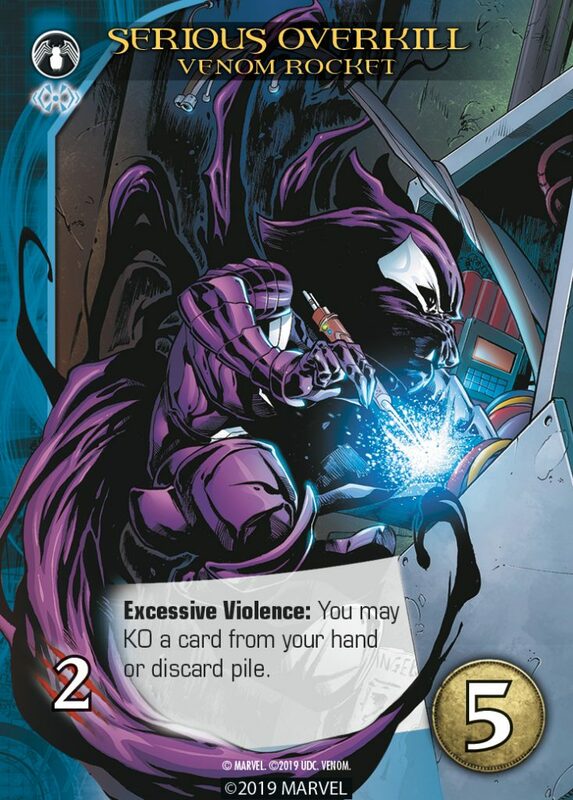 Once per turn, you can spend 1 more than you need to ﬁght a Villain or Mastermind “using Excessive Violence.” If you do, you get to use all the “Excessive Violence” abilities on cards you played this turn. If you don’t ﬁght anything this turn, or if you don’t spend an extra 1 on someone, then you won’t be able to use any of your Excessive Violence abilities . Keep in mind you may only use Excessive Violence once per turn when fighting. Be sure you have as many in play as you can before triggering it! 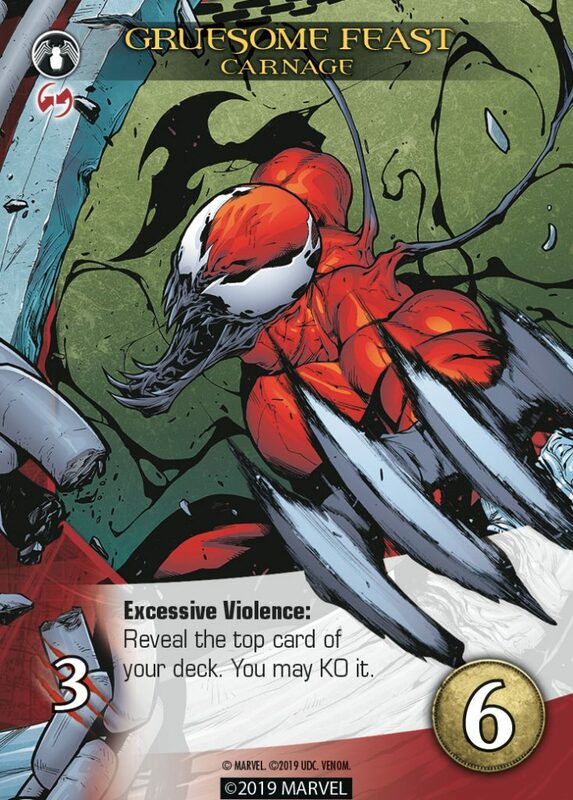 You definitely don’t want to be around when the likes of Carnage, or any symbiote for that matter, has Indigestion. This keyword is triggered when a player doesn’t have enough cards in their victory pile to trigger Digest. For example, some Heroes say things like: “Digest 4: Draw two cards. Indigestion: You get +2 . When you play this card, if you have at least 4 cards in your Victory Pile, then you use the Digest ability and draw two cards. If you have zero to three cards in your Victory Pile, then you use the Indigestion ability instead, getting +2 . If you have enough cards in your Victory Pile to use the Digest ability, you cannot choose to use the Indigestion ability instead. Thanks for tuning in for our Legendary Venom Preview. Be sure to pre-order the game or pick it up once it releases at your local FLGS. 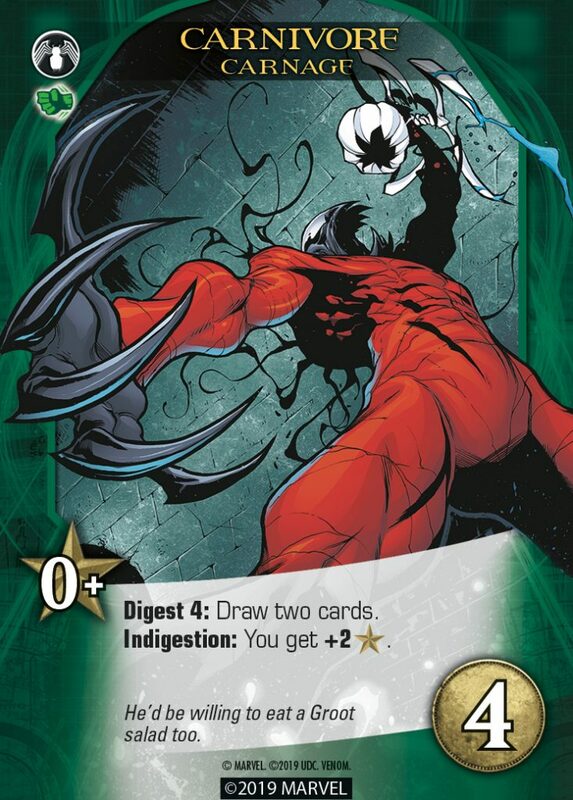 Legendary Venom is landing March 5th 2019! The art is great! I also like how Digest/Indigestion cards (at least so far) morph from Recruit into something more useful late game as you defeat Villains. Really cool.